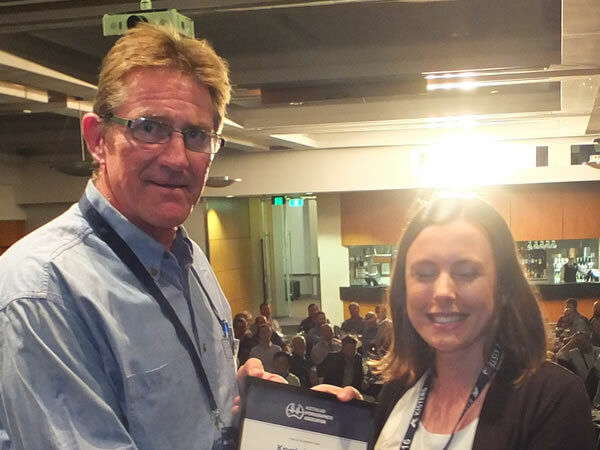 Krystal Hoult was inducted as an Associate Fellow of the Australian Hydrographers Association on Tuesday 26 October 2016. Krystal began work as a hydrographer in New Zealand in 2004 and over the years has worked for Government, equipment manufacturers and consultants in New Zealand, Victoria and NSW. She served as AHA Secretary from 2011 to 2014. Krystal was a driving force behind the AHA 2012 Melbourne and AHA 2014 Sydney conferences, her efforts no doubt contributing to the success of those events and was awarded a bespoke trophy to acknowledge her exceptional service to AHA following her resignation as Secretary in 2014. Congratulations Krystal, for your significant contribution to the profession and to the AHA and on your appointment as “Associate Fellow of the Australian Hydrographers Association”.